Samsung has updated the Gear VR, now it works for both Galaxy S6 and S6 Edge. Before the Gear VR only worked for Note 4 but not the Note Edge, which was particularly annoying since you had to make a choice between a curved display or a flat one with VR capabilities. 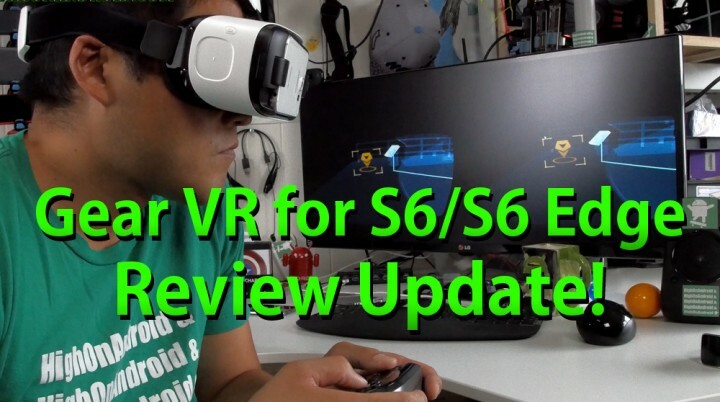 If you own a Galaxy S6 or S6 Edge though, this year you are both able to take full advantage of the new Gear VR for the Galaxy S6 as they both work flawless out of the box. Okay, so what’s changed with Gear VR for the S6 from Note 4 version? Gear VR for the S6 is 10% clearer due to higher pixel density of the Galaxy S6 screen. When I tried it out, it definitely improved by 10% and although it sounds small, everything looks more crisp and clear. It’s a definitely a huge improvement to your naked eye. I just feel like it’s more complete now, Samsung has really improved it to near level of flawlessness. And yes, there’s also now a dedicated micro-USB port on the new Gear VR so you can charge the device while using the Gear VR. I actually got to try this during my 20-hour flight to Thailand on my vacation and boy, I watched 6 hours of movies straight with no problems. Also, I did carry my Aukey USB Power bank, which supports fast charging and kept my Galaxy S6 at near 100% battery level the whole time. Okay, after using it in real life situation like an airplane, I have really gotten to appreciate what the Gear VR can do. It’s not all the virtual reality games you can play in full 3D and be fully immersed into it but I realize that simple things like watching a movie is the coolest feature. On the airplane to South Korea, I was watching my favorite movies on my Gear VR and I did also watch the Avatar movie in 3D which was awesome. Instead of having to watch on a small 7-10inch airplane screen with horrible resolution in economy class, I was able to watch all my movies in theater-size screens through my Gear VR. After doing that for couple hours, I tried to watch a movie on the airplane screen and simply couldn’t. That’s when I realized the coolest feature on the Gear VR is being able to have your own theater size screen anywhere you are at. Whether you are sitting in front of your computer or laying down on the bed, the Gear VR allows you to enjoy theater-size screen at the tip of your nose. Worried about orientation? No worries, the Gear VR allows you to easily re-orient the screen by holding down the back button if you are laying down on your bed. Want to watch a 3D movie? No problem, just copy and paste your 3D movie into the 3D folder and you can enjoy theater-sized 3D movies right there, anywhere you’d like. Games are also a ton of fun. With a bluetooth game controller, you can be fully immersed into your 3D world. Imagine being able to walk around in a 3D-environment without leaving your couch. Overall, if you are a globetrotter who travels on airplanes often, this is definitely one gadget you should have with you at all times. Or maybe you don’t have a TV in your bedroom, then this could be an ultimate movie watching device before going to bed. And yeah, there are lots of VR devices being worked on at the moment like the HTC Vive, but this is the only full virtual reality device that’s very portable (fits in your backpack eaisly) and works simply by plugging your phone into it. And that’s my review of the Gear VR for the S6. If you want to see some of the other features you can do with the Gear VR, check out my original Gear VR review for the Note 4, which walks you through many other Gear VR apps you will be able to enjoy. Get the Gear VR on Amazon here for $199. Also, I highly recommend the Samsung Gamepad for use with Gear VR, don’t get MOGA as it doesn’t work with Gear VR. Next story Gear S vs. LG Urbane Comparison & Buying Guide! Previous story BIG Android Giveaway July!